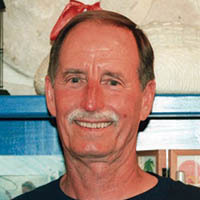 As a child in Miami's Coconut Grove neighborhood, Billy Harrison worked after school on the local commercial fishing docks. At 13, he got a job at the Miami Seaquarium. But it was at Miami's famed Pier 5 charter docks where he found his calling, fishing with fellow Legendary Captain Buddy Carey. Harrison's fishing career took him all over the world: marlin in the Bahamas; Puerto Rico's San Juan International Billfish Tournament with Roy Camero and Ralph Christiansen, Jr.; and in 1969, blue marlin off St. Thomas' North Drop. That's where Harrison grew a desire to tag and release marlin and giant bluefin tuna. In 1986, NOAA honored Harrison for tagging more blue marlin than any captain. His most memorable adventures are 12 trips to lower Africa, four seasons on Australia's Great Barrier Reef, and many outings to Panama; Costa Rica; Guatemala; Cabo San Lucas, Mexico; El Salvador; Ecuador; the Galapagos Islands; Colombia; and Venezuela.